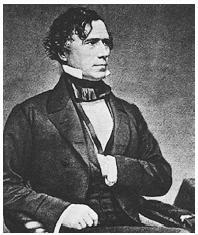 Pierce took office in March 1853, at a time when the issue of slavery threatened to divide both the Democratic and Whig parties, as well as the nation itself. Pierce sought to ease tensions by appointing a cabinet that contained a mix of southern and northern officials. Still critical of abolitionism, he enraged the antislavery movement with his signing of the Kansas-Nebraska Act of 1854. The act repealed the missouri compromise of 1820, which restricted the boundaries of slavery to the same latitude as the southern boundary of Missouri—36° 30′ north latitude. The new territories of Kansas and Nebraska were organized according to the principle of popular sovereignty, which permitted voters to determine for themselves whether slavery would be a legalized institution at the time of the territories' admission as states. Pierce retired from public life in 1857 and returned to Concord, New Hampshire, to practice law. He became a vocal critic of President Abraham Lincoln during the Civil War, however, attacking the Emancipation Proclamation of 1863. When, in April 1865, he failed to hang a flag in mourning for the assassinated Lincoln, a mob attacked his home. Pierce Mattie Public Relations, Inc.